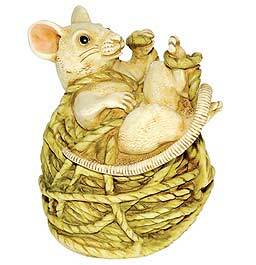 A curious mouse, wondering just how long a ball of yarn is, has become entangled during his experiment. The story of the Gordian Knot holds the key to his release. Once upon a time the King of Phrygia, Gordius, tied his wagon to a beam with a knot of the most exquisite complexity and proclaimed that he whoever could untie it would reign over his domain. For many years ambitious wannabes tried and failed. Alexander the Great finally solved the riddle – he withdrew his sword and cut through the tangle at a blow. Inside the box is a small Morris bell that artist David Lawrence, an avid Morris dancer, found lying on the pavement this summer. The trademark acorn is ingeniously hidden in the loops of yarn.